I have the pleasure to write about this as I personally own one of these. Yes, we actually buy the items we review! New concept right! So like a lot of you, when I wanted a stand up paddle board to start with, I don’t want to pay $1,000.00. I would prefer something I can bump around and not worry too much about as I am learning. I was looking for something with a foam top (not fiberglass or epoxy) and comes with everything I need (paddle that extends, leash, even a board bag). The Wave Storm stand up paddle board really answered all of these things. We do offer these on or paddle boards for sale page. The best part is that you can find them between $350 and $499 with everything mentioned above. That is a great price range to get started off. I do know that Costco carries this specific board where I live, so I have no problems if someone would prefer to go there to get theirs. If it saves you money, then by all means do that! For the price, it is a really great way to get into paddle boarding. Also, if a friend wants to borrow your board (I have a lot who ask) you don’t feel nervous or bad lending out this board. As far as comfort and performance, I have a blast on my for a casual day at the lake. It has a great balance to it, soft top, but not too soft, and planes in small chop fairly well. I’m not sure I would recommend or take this on the ocean as it might not plane well enough to keep up with the currents and waves in the ocean. I had my best friends son ride on the front with me so we had it loaded down pretty well (190lbs and 40 lbs). It still moved along just fine as I believe the max recommended weight is about 275 lbs so we were still well within that. It also isn’t too heavy or awkward to carry around and you can see in the picture that they give you the standard finger hold in the middle of the board which makes it nice. I didn’t take a picture of the board sock, but it did come with one. Now because I surf as well, the leash felt normal to me. It is about 10′ long and comfortable around a bare leg. This is not always the case with leashes. I almost would have liked a longer leash as I can’t dive off the front of the board wearing it, but that is just a personal complaint. Could you use this paddle board for yoga? It is wide enough and fairly stable compared to a lot of other boards, so I would say yes. The Wave Storm comes in a 9’6” and 10’6″ single-fin SUP. It is designed for greater maneuverability and is suitable for riders up to 275lbs. With an even distribution of surface area the Wave Storm has great stability & is easy to control. Great in both surf & flat water with an internal traction pad that adds optimal grip. It features an EPS core with 3 x Marine-ply stringers, textured deck for comfort, carry handle, and a resilient HDPE bottom skin. It apparently is hit or miss as to weather it comes with the leash and board bag. This probably is why the price also varies a little depending on where you find one. I will add to this review as the board gets older and let you know how it holds up over the years. Price Is Really Great For Getting Started! Honestly, how do you beat this price?! Even with the small downsides, this is great for a board to have around the house for those occasional times you want to get out and paddle board. Really great for people who are getting started as you don’t have to break the bank to do so. I could be biased as I own one, but I am doing my best to just give you the facts and my personal thoughts on it. 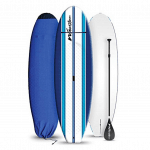 For more information you can also read our blog on Costco’s Paddle Boards. If I have to step back and take a look at this, I would rate it high mainly because of the price. It is hard to beat because of that. It will serve most paddle boarders needs. The only way it could be better is if it were everything that it is, but epoxy, the same price, and maybe some other color options. That is asking a lot, but thats what it takes to get a 5.0. I may change this rating as the years go on and we find out how durable it is. I would love to hear your feedback on this board! If you own one of these as well, leave a comment and let us know your opinions and what you think about it. I might be biased as I own one, so I would like people to know what everyone thinks. You opinion is not only important to me, but others looking to purchase this board. I just tried one of these in the surf today. It was really a fun board. I own a performance epoxy sup board. My friend and his wife just bought the two pack of these from Costco. It was the 9 foot six boards. We traded boards for awhile, and I had a blast on the wavestorm. Caught every smaller wave and could manuver down the line well. Slow to paddle as compared to mine, but it was fun. I really appreciate your feedback as mine can be jaded at times. I have not taken mine in the surf yet. They really are a hard board to beat based on the price when you just want something for occasional fun. 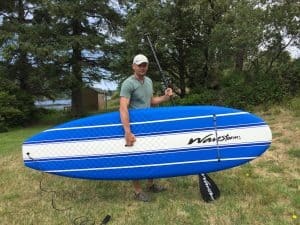 I picked up a Wavestorm SUP from Costco recently for $300. Yours was about the only review I could find, so I was a bit nervous buying it without much info. Glad I did, though. Mine’s green but identical to yours in dimensions. It’s a slightly newer model, and the only difference is they’ve added a deckpad and changed the deck straps a bit. Otherwise same board, same construction, same size, same everything else. My wife has a fiberglass hard board from Jimmystyks, and this one compares well but for less than 1/2 the price. It’s 9’6″ long, 33″ wide, 5.25″ tall, quite stable, lightweight (25 lbs), and just super fun. You can’t turn on a dime with it, but it tracks pretty well and moves easy enough on the water to be quite enjoyable. The $300 costco package currently includes an adjustable paddle (very sturdy, but I don’t love the adjustment mechanism which requires two hands to adjust), leash, fin, and board sock. I actually appreciate the board sock because it provides some protection for the surface of the board when I transport it & lash it to my roof rack. Worth noting Costco only sells them in a pair on their website currently ($600) but my local store in Georgia sells them individually. 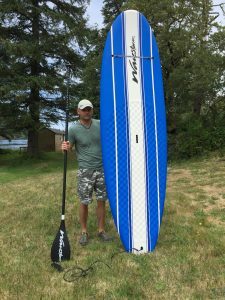 My whole family loves this board, and I can’t imagine a better SUP for newbies who want to get on the water cheap. Love it! Hello y’all! 1st time paddle boarder and I got the 9’6″ at Costco today. Thanks for the reviews as it gave me a good way to judge my expectations vs what I would be spending. I’ll be using it in the lakes mostly but not right away. I’ll do my best to get back here and give my own review. Awesome Daniel! Would love to hear your thoughts once you have used it a bit! Thanks for the detailed reviews everyone. I went to Costco because I’d love to buy that package but I don’t think the board will fit into my truck and I’m not comfortable mounting it on top by myself. Anyone know if it’s easy to fit inside an Expedition EL? I don’t not have an Expedition Janice or I would help. Hopefully someone else may chime in. Thanks for the reviews. I just picked up one of these boards for my wife and she loves it. We took them out into an ocean bay with mild chop and it handled perfectly. For general paddling around, it works as well as my Jimmy Stix, at a fraction of the weight. It is really easy to carry and stable for my wife at under 140# and also for me at over 210#. Would highly recommend at this price point. 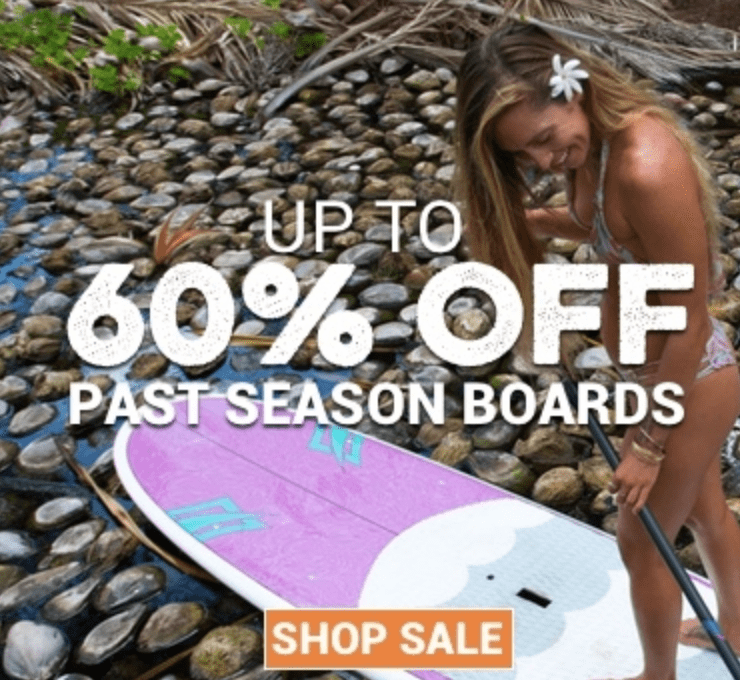 Obviously, do not have unrealistic expectations… if you are looking for a super specialized board, you need to pay for that and this board probably isn’t it, but this is a great general purpose paddling board at a reasonable price. Mike, thank you so much for the awesome review. I really appreciate it and I know it helps a lot of other buyers as well! 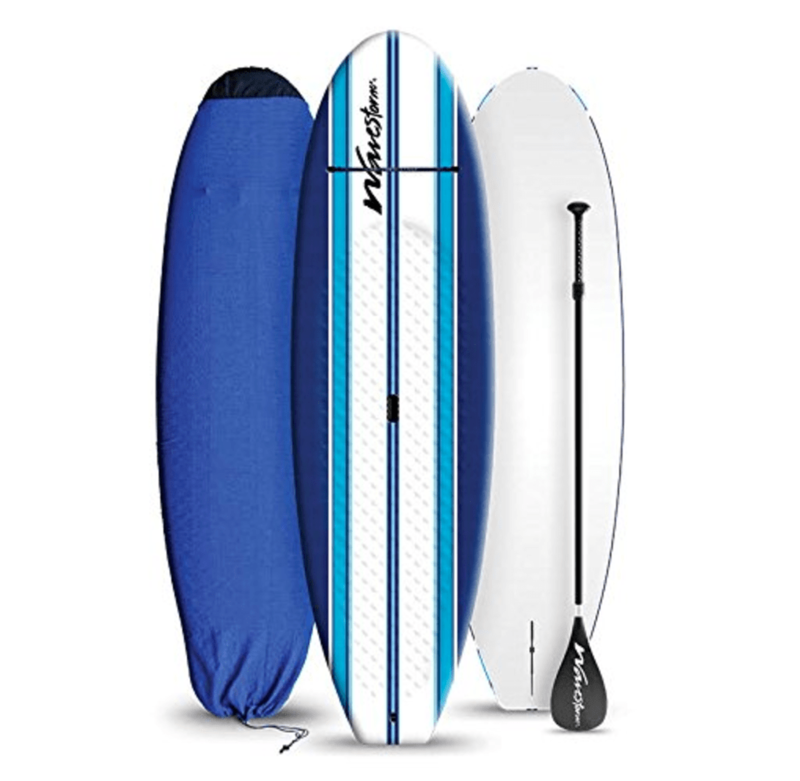 Hi I was wondering how these boards compare to the inflatable boards? Besides length what is the advantages or disadvantages to 9’6″ board compared to a 10’+ board? Well, inflatables are nicer if you don’t have the room to put a 10′ board. Inflating them can be a little hassle and takes some time. Also an inflatable will have more mass to it, so it will get blown around more in a strong wind. You can also beat up a solid board a bit more. I like both, they both have their ups and downs. As for 9’6″ VS 10′, you won’t see a lot of difference. Technically a 9’6″ will turn easier simply because it is shorter and easier to turn. A 10′ will have a little more flotation so it can handle more weight. So if you want a dog to ride along with you, I would lean on the 10′ VS a 9’6″. Hi, my 10 year old Daughter has been pecking Dad and I for a while now “Dad/Mum please can we buy a paddle board” (We)? She can use paddle boards with ease and I don’t think this is just a phase. Anyway, great price at Costco UK and the reviews are pretty good too but any good for my Daughter? She’s average height/ weight and looking for something she can use probably only twice a month maybe and take on holidays. Hi Sam, The Costco board would work as it is shorter than a lot of boards and she could grow into it and it is hard to beat the price. Turning it will just be a little harder then on a shorter board. Again, the costco board is hard to beat price wise and she can still have fun and eventually grow into it. There is also a newer board that I have yet to review that is a 7′ and can handle up to 100 lb rider called “The Storm Blade”:https://amzn.to/2K67mNX it is insanely inexpensive! I’m not even sure how they can make and ship these for that price. I cannot vouch for this board at all though and again, have yet to test it as I just found it, but I will make a point of doing so in the future. Maybe someone else on here has tried it and can chime in on it.